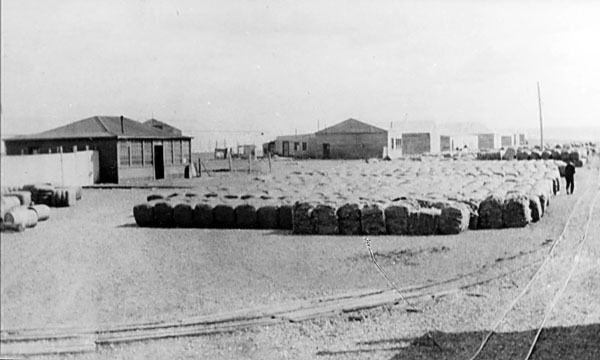 The New Patagonian Meat and Cold Storage Co. Ltd. began work in 1910 on a new frigorífico on the eastern outskirts of Río Gallegos. 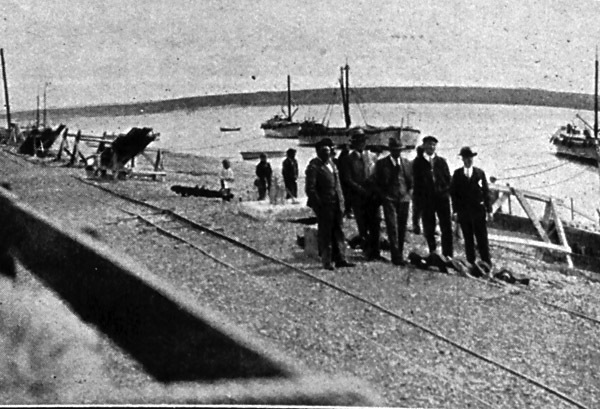 The site was not directly on the waterfront and the plant's 3' 6" gauge railway line was therefore extended northwards down calle Malaspina to the muelle. 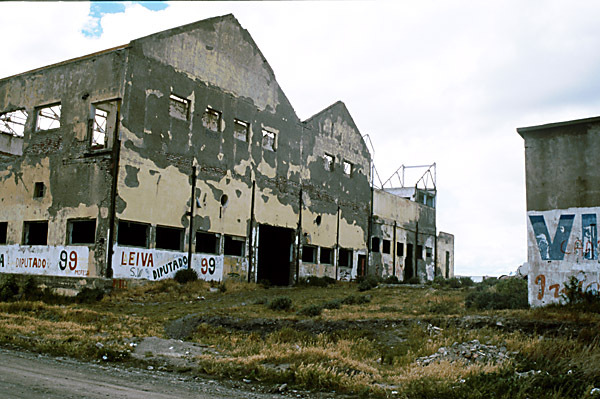 The owners were almost immediately taken over by the Swift Beef Co, and it is as the 'Swift' plant that the frigorífico was known for the rest of its life. It survived until the 1970s, but the derelict buildings remain, as seen below. 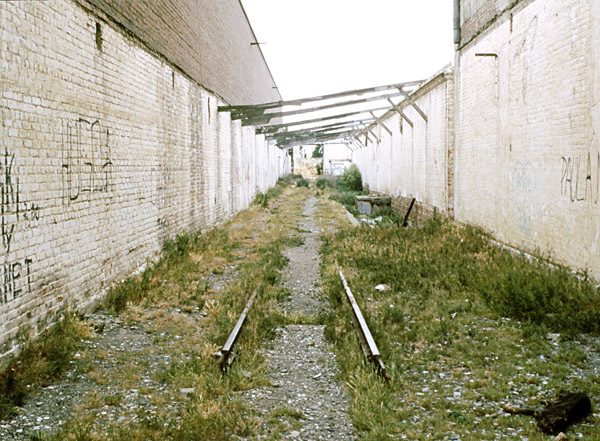 Within the abandoned frigorífico track survived until nearly 2010 before being cleared, as seen below. 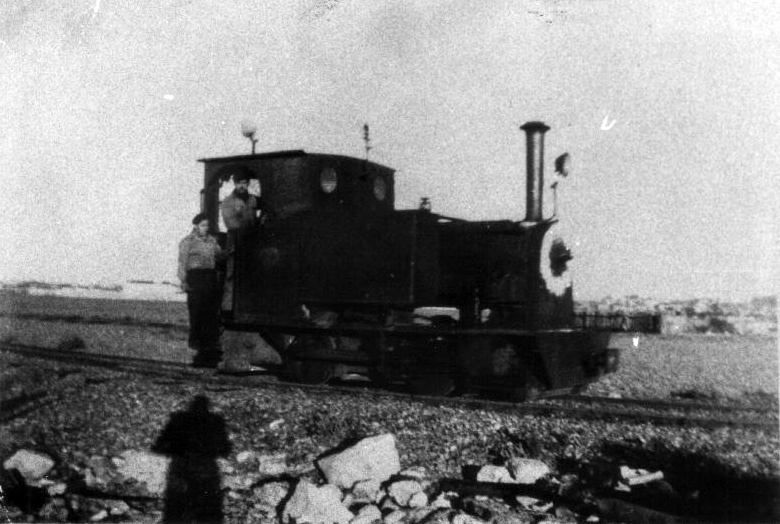 The plant had one steam locomotive, an Avonside 0-4-0T, no. 1592 of 1910. This also still survives, though in an extremely poor condition. The drawing was taken from an Avonside catalogue of the 1920s. The loco was of their class NB. 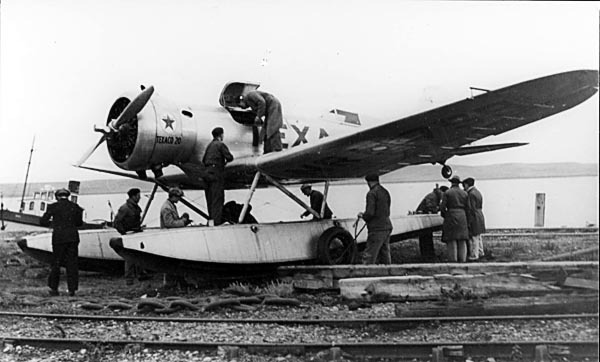 This was a small design, weighing only six and a half tons in working order, and available for gauges between 2' and 3' 6" (1). 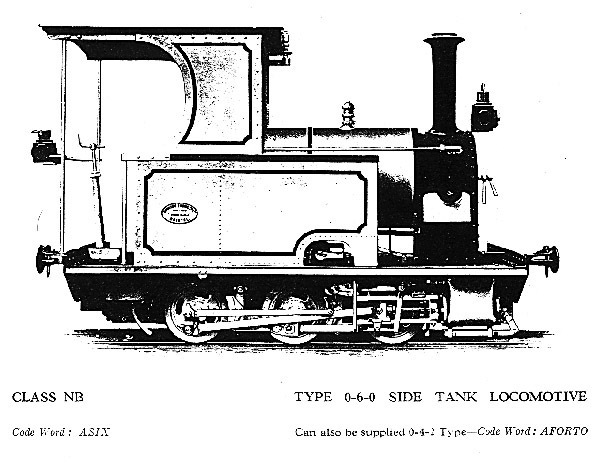 Whilst the Swift loco was an 0-4-0T rather than an 0-6-0T it seems likely that the overall wheelbase was not all that different. The photo below shows it in 2000, in the local museum's outdoor facility near the big roundabout that was at the time on the southern outskirts of town. 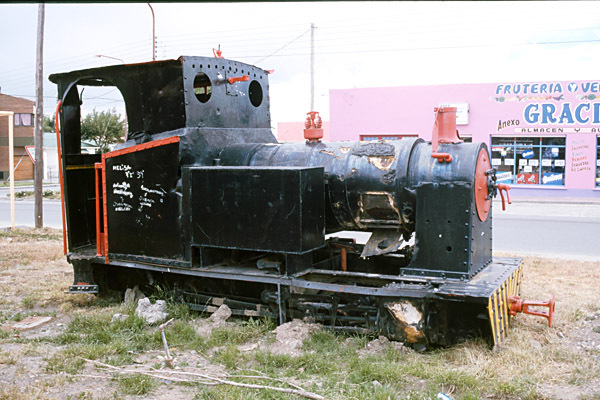 More recently it has been moved (along with the RFIRT's Henschel 0-8-0CT) to the Amigos del Tren compound near the old RFIRT loco shed (2). 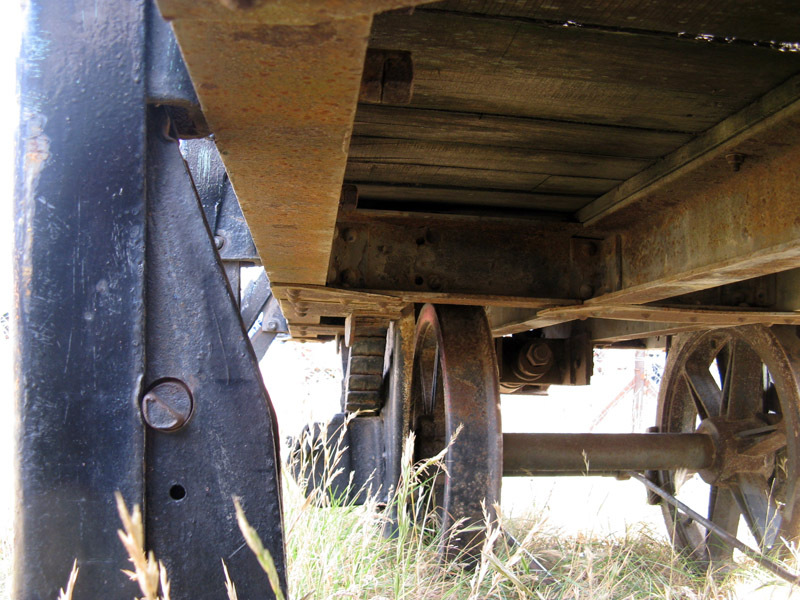 A single flat wagon lay near the loco, both at the roundabout and now in the museum, where in 2014 David Sinclair crawled underneath it. It had seemed likely that this came from the Swift plant, despite the chopper coupling. However, underneath, it was clear that it had originally been metre gauge, but was now 75 cm gauge. 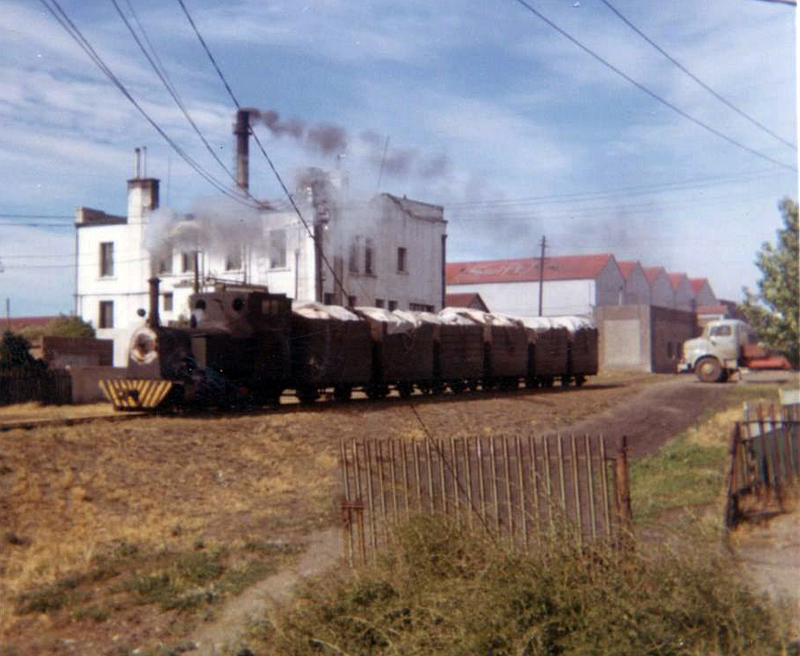 It would thus appear that this may have been an ex Central of Chubut wagon which had been re-gauged at the Bahía Blanca North Western works for the Río Turbio line. Note how the spring does not bear directly on the solebar, as it would have when new. 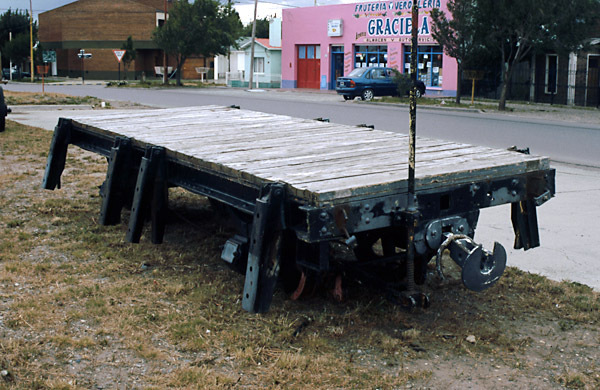 The Swift muelle had a rail-mounted steam crane on it, of unknown gauge though almost certainly wider than the 3' 6" of the main frigorífico system. From the Facebook page of José A Weisser Fohmann comes this view, taken in 1982, looking out to sea, along the Swift muelle. 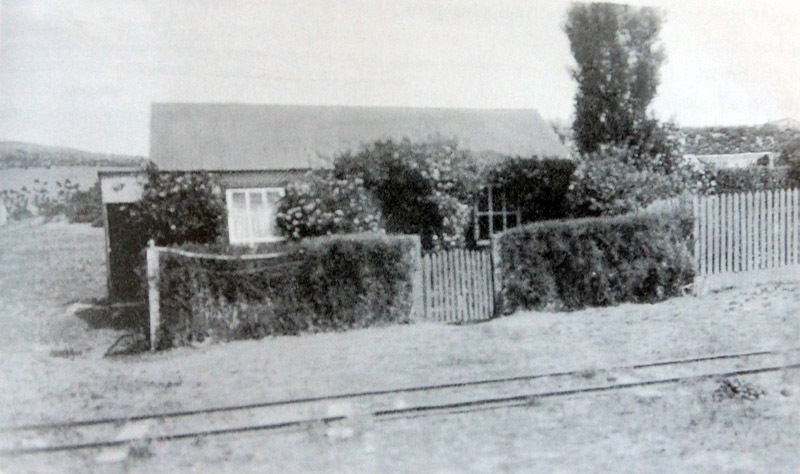 The track on the left is almost certainly standard gauge and was the one on which the travelling steam crane operated; it can be seen that it uses bull-head rail with very closely spaced chairs. The one on the right is where the trains ran and is of 3' 6" gauge. 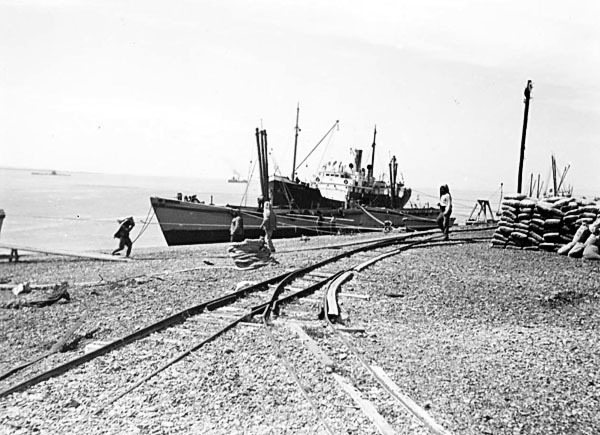 Río Gallegos seems to have had additional narrow gauge railway tracks along its foreshore, probably of 60cm gauge and linking to the 'Enosis' muelle. These two pictures were taken by Señor Walter Roil, a professional photographer in Río Gallegos. The one above was taken in 1940 and the other in 1935. [These photos belongs to an unrelated website, which can be accessed directly by clicking on the images.] 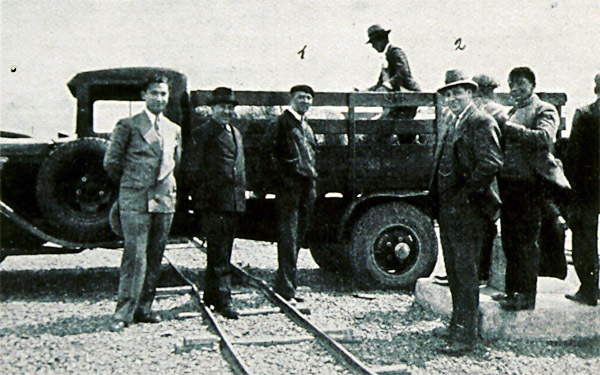 More recent (2016) information from Río Gallegos suggests that this line was operated by the La Anonima (full name La Sociedad Anónima Importadora y Exportadora de la Patagonia), the Braun-Menéndez conglomerate, in connection with the wool exporting side of their business. The two photos shown here were taken from Argentina Austral magazines of the 1920s. 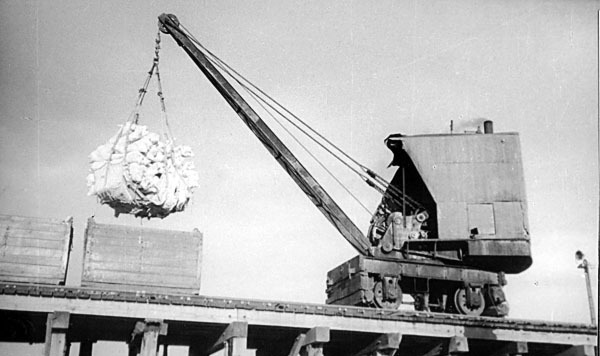 They were taken on the occasion of carcases from estancias Bella Vista and El Cóndor being loaded for shipment north in the steamer José Menéndez. 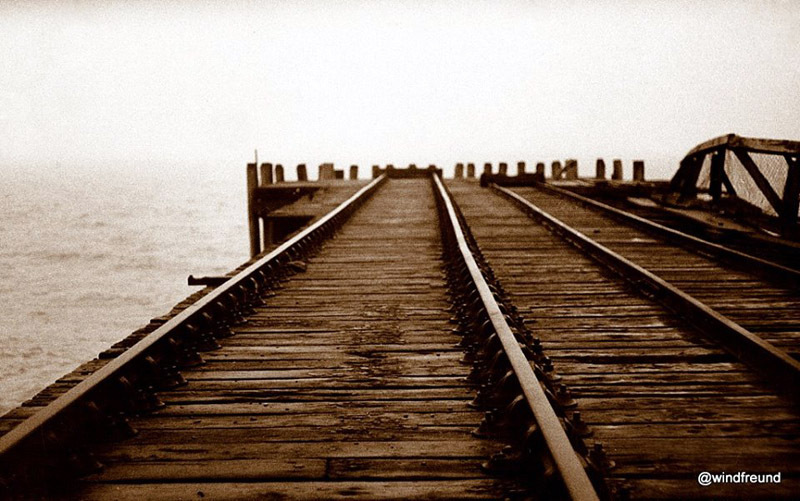 60cm gauge railway tracks can be seen in both illustrations. 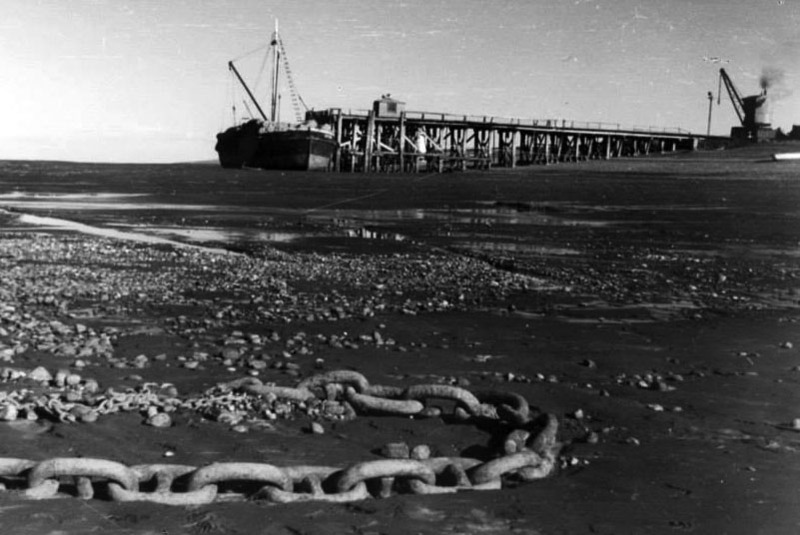 We don't know the location of these two photos, but it is possible that they are at Puerto Cóndor from where the wool was shipped before the construction of the road to Río Gallegos. 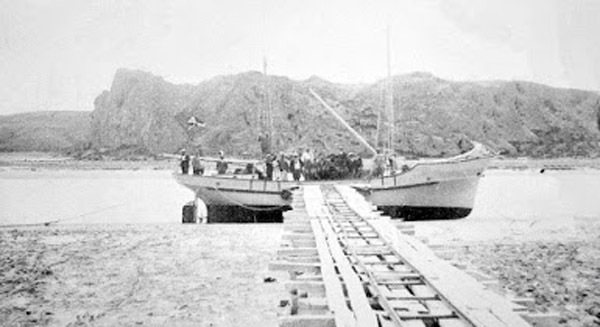 The upper view shows the line passing in front of the original manager's house, while the second one shows the muelle with the estancia's two vessels (Malvina and Priscilla) alongside. Paso Marsicano está ubicado cerca la cabeza de la ría Deseado, unos 45 km arriba de la ciudad homónima. Hemos recibido sugerencias que existía un ferrocarril aquí para servir la estancia, pero esto es la primera evidencia firme a descubrirse. Se descubrió en el sitio web Puerto Deseado: Cabos Sueltos. 3 A Story of Patagonia by John Locke Blake, The Book Guild Sussex, 30 Apr 2003.